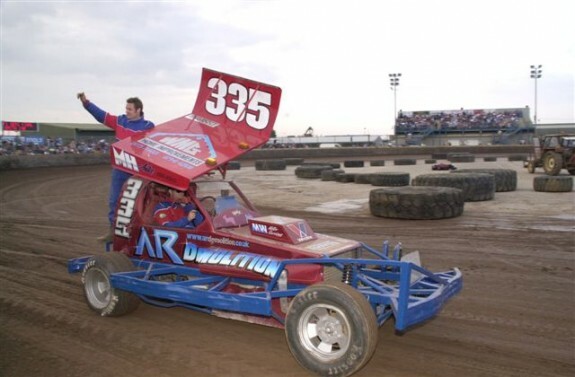 Mark Woodhull caught up with F1 Stockcars recently and so over to Mark. Hi, I’m Mark Woodhull driver of the 335 car, I’m thirty four years old, married to Tracey and together we have one son Jake who’s eighteen months old (At time of interview – Ed) and we’re from Leicestershire. Hi, Mark what’s your occupation? I’m a mechanic at the family Garage M.W Motor services which me and my father started about seven years ago. I do all types of Car and Van repairs as well as a bit of horse box work. How did you get into racing Mark? From my dad. He used to Race F1’s so it was passed onto me, I believe I went to my first ever meeting when I was just two weeks old. So what is your first real memory of Stockcars? The 1987 World Final at Belle Vue when John Lund (driver of the 53 car) won. I think that’s my first proper memory, loads of snippets before then, especially from Bradford but that would be the first proper memory. Who were you a fan of going up? My Dad of course, then I’d say Len Wolfenden he was exciting to watch as a boy. Also Mike Close and John Lund. Always gave them a cheer as well. When did your Stockcar racing begin? When I was ten years old I started in the MinStox formula; my first ever meeting was a Friday night meeting at Scunthorpe. I started at the very back with the black cross on the back and I think I managed to get about 12th in that. I was well chuffed, and hooked on Stockcar racing ever since. From the MiniStox’s you moved into Formula One? No, I went into the formula twos next. I spent ten years racing F2’s before moving up into the F1’s in 2000. I had one go in a borrowed car at the back end of the 1999 season at Kings Lynn think it was the October meeting, that was fantastic. That was it I was moving into F1’s, by the time I got my car race ready would have been the April 2000 meeting again at Kings Lynn. That was the learning curve, racing a ‘proven’ race set up back in ’99 to setting your own up. I didn’t do as well that meeting but I was hooked. Do you have any stick out memories from your racing? As a shale racer it would be winning the last Shale Final at Skegness before it was turned into a Tar Track. So no plan’s to move onto the Tar? Not really, I’ve said before that I would like to give it a go, but just not really got round to doing it. I do prefer the Shale. And on the odd time I’ve been out on Tar with a good racing set up I’ve really enjoyed it and now having just started a family I don’t really think I’ll get the time to make a proper go at Tar racing as well just at the moment. How much time do you try and put in at the workshop? That’s where I’m quite lucky I have the car at the garage so I can put in a few hours straight after work. I’ll probably put in two to three evenings a week when we’re racing. But it all depends on what needs doing, you might have less damage one week and get away with it or have to spend more time the following week. Having the car at my place of work is a great help. I have a big family team, probably have four to five mechanics including my Dad and father in law. Plus everyone back stage; Mums and wives. We have a good bus. How does Tracey your Wife feel about all that time down the garage? Tracey’s great, she’s into her racing. We actually met at the tracks and racing social do’s, so she’s not only supportive but also a fan herself. Your current car looks a little different to many that are out there? Yes, it’s my own self built car. Serving me pretty well, I maintained Red grade for the whole of 2008, which just racing Shale is an achievement I’m proud of. But the competition is getting really high now, there’s lots of very good drivers out there now and the cars keeping moving on. Just last season (2008) there were Final winners from all grades. It’s really competitive now, and that can only be a good thing for the sport. Any tracks from history you’d like to have back in the fixtures? The old Belle Vue and Bradford definitely. I was lucky enough to race at both tracks in my MiniStox but not an F1 and from racing at them they are the one’s I’d want to race at in my F1. As well as turning Skegness back to Shale. Do you have time for any other interests away from F1 Stockcars? First would be my family, then just normal things. I love watching different motor sport on TV and still enjoy going to watch Stockcar racing even if I’m not racing, you can’t beat a good F1 stockcar race. I also enjoy watching the PDC Dart’s when it’s on. And now and then go to watch the Speedway. What about your Favourite meal? Steak and Chips, Medium to Well Done, wins every time. Two. New Zealand loved it when we were over there but then that was involving racing, I’d love to go back to New Zealand for a racing holiday. And the Caribbean that’s nice. Good place to relax and get away from it all. Do you have much time for TV? Not really. Other than sport I enjoy comedy. Only Fools and Horses makes me laugh even the Carry On films. But other than that not really one for TV. How do you finance your racing? A lot of it come straight from me and M.W Motor services, but I do get help from a few others. A.R Demolition help me out and have been pretty much with me since day one. M.H Autos help in way of Sponsorship along with AWELD, he provided me with all the steel when I built my car. As well as my family and friends, they all help out. Thank you very much for your time Mark, It’s been great talking to you and getting to know you just that little bit more than ‘the driver of the 335 car’. All of us here at F1Stockcars.com wish you every success in your future Stockcar racing, keep turnin’ left. Not a problem, and with any luck you’ll be catching up with me again sometime soon. Mark waves to the crowd riding on the back of his car during a parade lap.